← America: Where Women and Doctors Need Bulletproof Vests? Ed Suominen was raised in a small sect of Lutheran Christianity called Laestadianism. Of the 32,000+ denominations into which Christianity has fractured, his is one of the more conservative. Members believe in the literal truth of the Bible, including the creation story. They eschew sins like drinking, dancing, watching television, wearing earrings, and playing school sports. They marry only within their own sect and believe God alone should decide how many children they have. Suominen followed the rules; he met and married the right kind of girl; and together they have 11 children. Outsiders sometimes scratch their heads about the dogged insistence of creationists that Adam and Eve actually existed 6000 years ago in a perfect garden without predators or pain, until they took Satan’s bait and bit into a world changing apple. How is it, 150 years after Darwin’s Origin was first published, that we are still fighting about what will get taught in biology classes? Why, in their determination to refute evolution, do some Christians seem intent on taking down the whole scientific enterprise? I saw it happening right in front of me on my computer screen. As an engineer with lots of software experience, I understood what the computer was doing. Simulated organisms were evolving remarkable abilities to move, swim, etc., and nobody was designing them to do that. Random mutations and genetic crossover between the fittest individuals in the population produced a new, slightly more evolved population. Repeated over hundreds of generations, it worked. 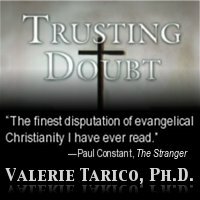 Gallery | This entry was posted in Musings & Rants: Christianity and tagged creationism, evolutionary biology, Laestadianism, recovery from religion. Bookmark the permalink. Thanks for this post. I have read “Examination of the Pearl” and really enjoyed it. I will now have to read “Evolving out of Eden” . Thanks again for all you do. Yes, this was a delightful read. For me, the Biblical story would have required clinging to a dependent childhood forever, that was the first crack in the dam of credulity for me. I could almost manage a deist approach, somewhat, by saying “Ok, blah, blah…the creation story, nice metaphor….now it is time to GROW UP!” But the literalists? I never could wrap my mind around how the very world didn’t shake them out of ….by dropping them HARD out of the tree at the center of their mythical garden. I’ve been through the exact same process, and every single word Ed writes I can completely relate to. I was in a similar fundamentalist group, a captive of that mindset for more than 20 years. I too found the cognitive dissonance related to the creation myth extremely difficult to overcome, until I began to study evolution. The only difference in our experiences is that I went through the transition from fundamentalist extremists to atheist completely on my own, without family, friends or mentors. I had escaped the cult physically, but not yet psychologically or spiritually, until I started university. It was a gradual process, and at first I put all my religious beliefs aside so I could concentrate on academic studies. I suppose you could say I was agnostic during that period. My initial, brief exposure to Darwin’s work was enough, though no where close to the level Ed did, to put my mind at ease as to the question of creation or evolution. Several years later, òn the 30th anniversary of Richard Dawkin’s “The Selfish Gene”, I revisited Darwin`s work in more depth, as well as read most of Dawkin`s work. Just as Ed has, I have found the facts of evolution far more satisfactory than faith in a fictional account of life. Even Ed`s point on talking to creationist family and friends is exactly my experience. An amazing story, thanks for publishing this. In a couple weeks I will begin writing my own memoir of my experiences and transition from fundamentalist cult member to atheist human rights activist. I hope I can get a draft done over the winter. A very enjoyable interview to read. Congratulations to Ed and his Wife, on their enlightenment. And, I take my hat off to you Ed, for getting out there and telling people about your experiences. I feel certain that stories like yours will be of great help to others struggling with their beliefs, as they emerge from religious indoctrination. It appears he gets it. Science is not “anti-god”, it never mentions it and doesn’t need to. Accepting the fact of evolution does not require giving up belief, but it sure makes it harder to keep it (re: the half-soul problem).